The set consists of 36 hexagon tiles. One side of each tile is labeled with a number from 0 to 5 inclusive and each tile is labeled with a different configuration of numbers. Zero “0” can be a wild number and can be used as any number [In some Hexuinto games]. The back of each tile is divided into six sections and color coded and labeled with different symbols : the red sections are labeled with a zero, the green sections are labeled with a spade, the light blue sections are labeled with a heart, the orange sections are labeled with a club, the dark blue with a diamond and the purple sections are labeled with a star. The Hexuinto tile labeled with the numbers [0,1,2,3,4,5] is the starter Hexuinto tile. Each of the six sections on each Hexuinto tile is both color coded as well as numbered. Zero is red, one is green, two is light blue, three is orange, four is dark blue, five is purple, but the colors can vary from game to game. 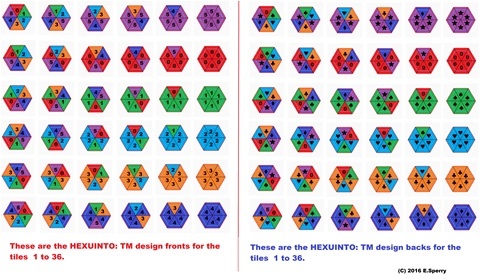 Each hexagon tile in “Hexuinto: tm” is called a Hexuinto. There are countless different Hexuinto games and within each game, there are many variations of play. The purpose of these rules is to get you started with a few simple games. One of the Great things about Hexuinto: tm is that anyone can learn the basics very quickly, but as you play and progress, you will find many additional levels of the game and as your experience and skills develop, you will become a better player. Start with these simple game rules to learn play. Two to Four people can play the games we'll show you here. If Four are playing, each person can play individually or you can group into two teams. Draw straws to see who plays first. Now return those Hexuintos to the table and mix them again. Now draw the Hexuinto for the playing of the hand. The person who won the right to play first draws first. Go around the table with each player drawing one Hexuinto until all have the Hexuinto needed to start play. Use a screen to keep the other players from seeing your Hexuintos. Place a start Hexuinto on the table. Each player in turn lays down a single Hexuinto according to the rules of the game being played. Play proceeds clockwise around the table. If a player has a playable Hexuinto, he must play it when his turn comes. You cannot hold back a playable Hexuinto for strategic reasons. Everything is the same except when a player cannot place a Hexuinto, he must draw Hexuintos from the collective until he gets one that he can play. All the rest of the game remains the same. The limitation here is that in a 2-player game, the last two Hexuintos in the collective may not be drawn and in a 4-player game, the very last Hexuinto in the collective may not be drawn. With each hand, you accumulate points. Before you start, and depending on how long you want to play, set a number (say 100 or 200) and the first player to reach that total score wins the game. This is a simple game in which you can score points every time you play a Hexuinto. Number of players: 2, 3 or 4 may play. If 4 are playing each may play individually or you may create two teams of two players each. The Objective: To outscore your opponents. You score by adding up the count of Hexuintos at the ends of the layout after each play. Each player is dealt 6 Hexuintos and sets them up so the others cannot see them. Hexuintos must be played so their sides match. Hexuintos are laid with matching sides Play proceeds clockwise around the table. In Hexuinto muggins, you can score each time a Hexuinto is placed as well as at the end of the game. The object is for the open sides of the Hexuintos to be a multiple of 5. For each multiple of 5, you score one point. Open sides are 1,2,3, 4,&5 count is 15, divide 15 by 5 equals 3, score three points. Open sides are less than 5, no points. Counting the score after each play When a player makes a score after placing a Hexuinto, a scorekeeper notes the score at that time. Drawing from the collective: If a player cannot place a Hexuinto, he draws from the collective until he can make a play. 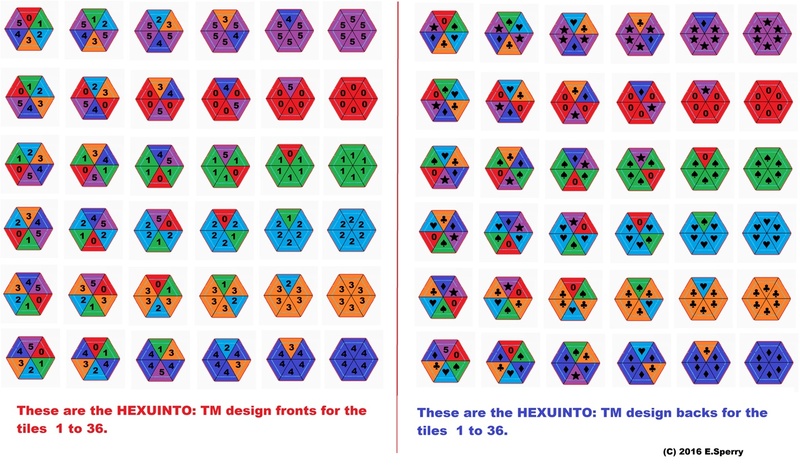 In a two-person game, all but two of the Hexuintos in the collective may be drawn In a three or four-person game, all but one of the Hexuintos in the collective may be drawn. Ending the hand The first player to use all his Hexuintos calls "finished" and this ends the hand. If no player can play his last Hexuinto and the collective has been depleted down to one or two Hexuintos, the hand is over. Scoring at the end of the hand When the hand is over, the player (or team) with the lowest number on their remaining Hexuintos receives additional points based on the numbers in the opponents hands. For every multiple of 5 in the opponents hands, the winner receives one point. For a count of 1 or 2 above a multiple of 5, there is no additional score. For a count of 3 or 4 above a multiple of 5, round up to the nearest 5. Ending the game, winning: Keep playing the hands until one player or team has 100 points. That ends the game. Want to play longer? You can set the game ending score at 150 or 200 or whatever you would like. HEXUINTO: TM , COPYRIGHT, January 28, 2016: by EMMOR RAY SPERRY. The distinctive design of “HEXUINTO: TM” and the word " HEXUINTO: TM "and the game system HEXUINTO: TM is a Trade Mark of EMMOR RAY SPERRY. All rights reserved. Any infringement on these copyrights or these trade marks, in whole or in part, by any means, without written permission from EMMOR RAY SPERRY, is strictly prohibited. United States registered copyright has been applied for.